Throughout 2017 we have been working with the Solicitors Regulation Authority to create a campaign that will encourage young people taken into police custody to utilise the free provision of a solicitor. Many young people who find themselves in this situation are unaware of the law and that a provided solicitor is there to help and represent them. Our brief was to provide assets and collateral that solicitors could use that would break down barriers and establish trust. It was clear from research that key messages would need to be simple and relevant to the target audience. 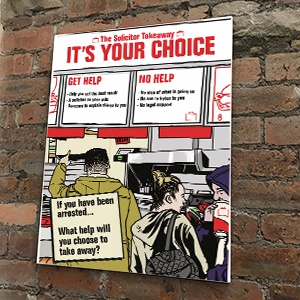 Working closely with the SRA, Just for Law Kids and a panel of young people (both offenders and non-offenders) we developed a number of concepts, before unanimously deciding on the ‘It’s your Choice’ / Solicitor Takeaway campaign. By analogising the process of choosing to work with a solicitor with choosing a meal in a takeaway, we were able to place the ‘unusual’ and often ‘scary’ situation facing them within a familiar context. The youth-friendly illustrative style was chosen to be deliberately anti-solicitor, yet would establish the solicitor’s credibility from the outset. The concept tested really well with all focus groups and the campaign is being rolled out nationally from January 2018.